Christine Kono, Dimitris Kraniotis and Thomas McManus would like to continue their research on spontaneous composition and create events using their research. Christine Kono, having worked as dance with, among others, Georges Balanchine, Martha Graham, Eliot Feld and Kurt Jooss, met in 1992 at Pina Baush's Wuppertaler Tanztheater, the poet, Dimitris Kraniotis, formed as dancer by Jerome Andrews. Since then, their shared conviction to the adventure of dance has led them to an intensive research on the Fundamentals of movement: the awakening of the energy of the spine; the relation of breath and rhythm, of presence and space, of chaos and form. Thomas MacManus was a dancer with William Forshyte in Ballet Frankfurt from 1987-99. He now has his own company, "Commerce", with Nik Haffner and is a choreographer and teacher for many companies. In 1999, Christine and Dimitris gave with Thomas a 3-week , all-day workshop for the Centre National de la Danse in Paris. They worked together on technique, improvisation and composition. As a result, ever since, they continue to give each other feed-back as dancers, teachers and choreogrphers. 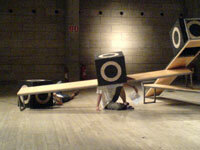 In the space of Philippe Decouflé in Paris, they created events called "Impromptus" in April/May 2006 and "Nothing always returns" in October 2009. - to promote a way to compose which appreciates the ephemeral quality of dance and supports the vitality of the moment of creation. Before the research begins, exercises to awaken the spine and to circulate the breath and energy are implemented. The base of these exercises is the work of Jerome Andrews on the original Pilates machines and the transformation of classical ballet through the application of body-awareness. Once the body is awake, improvisations themes, such as those found in Forsythe's "Improvisation Technologies", are given which help the dancer to experience this alert body in space and to speak with his movement by "listening" to his body. Through exchange, observation and discussion, each participant develops his own language and ability to "read" the language of his colleagues. Once the moviments begin to "speak", the common theme of an event/performance begin also to appear. The goal/atmosphere to be created becomes clear. According to this goal, the dancers find a way of spontaneous composition which supports the creative spirit of everyone involved.